This is a very simple recipe which goes well with rice and jeera rasam. It is so easy to make and is also good for health. This is an authentic Tamil brahmin recipe. Whenever I prepare this, I make jeera rasam and vegetable curry or just any vegetable kootu to go along with it. 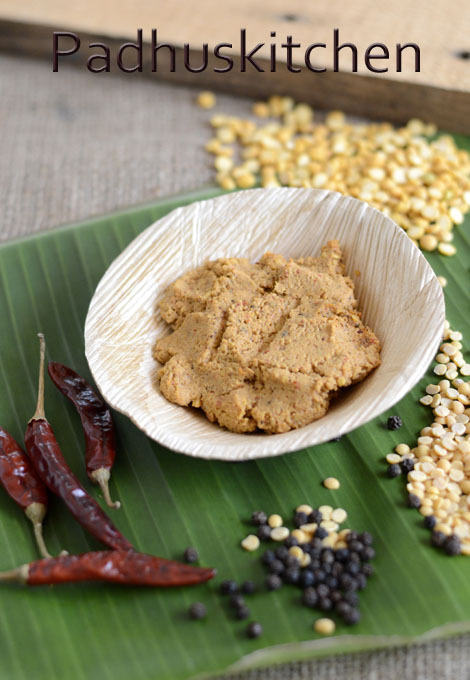 Today let us learn how to prepare paruppu thogayal following this easy recipe. Heat a tsp of oil, fry red chillies, hing and keep it aside. In the same pan, add tur dal, bengal gram, whole black pepper and saute in medium flame until dal turns golden brown. Add grated coconut, saute for 2-3 seconds and switch off the flame. After it cools, grind it with little water, needed salt to a coarse paste. Serve it with hot rice topped with ghee. Variations- You can prepare this thogayal with tur dal alone. You can add 2 garlic cloves while frying the dal if you like the flavor of garlic. Adding grated coconut is optional but recommended. Thogayal n rasam is an awesome combination! !!! Before marriage this was pretty much our Saturday menu @ homw. Looks so yum!!! my favorite ! well go with rasam ! Thogayal looks simply yummy...love to eat with rasam and curd rice..
Nice delicious Paruppu Thogial,we used to prepare with Toor dal. Can survive for many days with this thogayal. Hi can small onions be added to the ? For this recipe, it is not required. But there is nothing in trying it. I did not know we could add kadala paruppu to thuvaram paruppu. I add some tamarind when I grind this thugayal just to give a sour taste. Your recipe does not mention about tamarind. Also seasoning is not mentioned here. May be all these are just optional for taste. Seasoning is not required for this thuvaiyal. You can add a small piece of tamarind after sauteing the dal. It will enhance the taste of the thogayal.